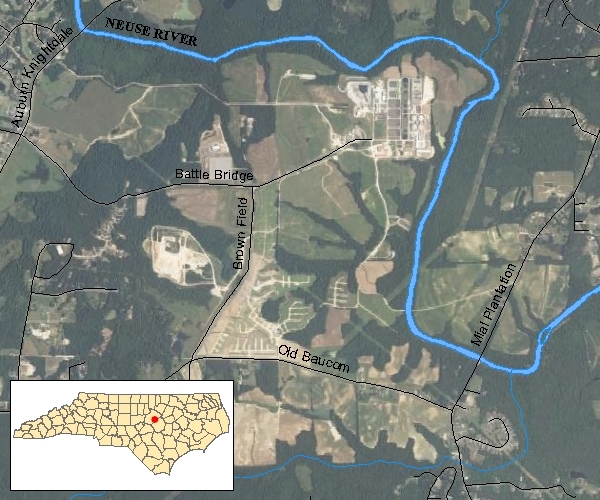 This station, located at the City of Raleigh's land application fields surrounding the Neuse River WWTP, is situated in the Raleigh Geologic Belt. The Raleigh Geolgic Belt consists of granite, gneiss, and schist. Bolich, R., 2007, Hydrogeologic Characterization of Diabase Dike Intrusions in Granite, Geological Society of America Southeastern Section Meeting Abstracts with Programs. Bolich, R., and K. McSwain, 2008, Geologic Control of Groundwater Flow through Riparian Buffers, American Water Resources Association Summer Specialty Conference.